It may sound like witchcraft, but believe me when I say you can make a monochrome look out of polka dots – it’s all in the colours you choose! I wore this outfit a couple of weekends ago for an informal birthday party – held at a friend’s house and one that promised dancing round the living room (the adults all being in their 40s and relishing all the 70s, 80s and 90s hits we were playing… We have no shame). Therefore I wanted to wear something a little fun that also included comfy shoes for all day plus evening dancing. 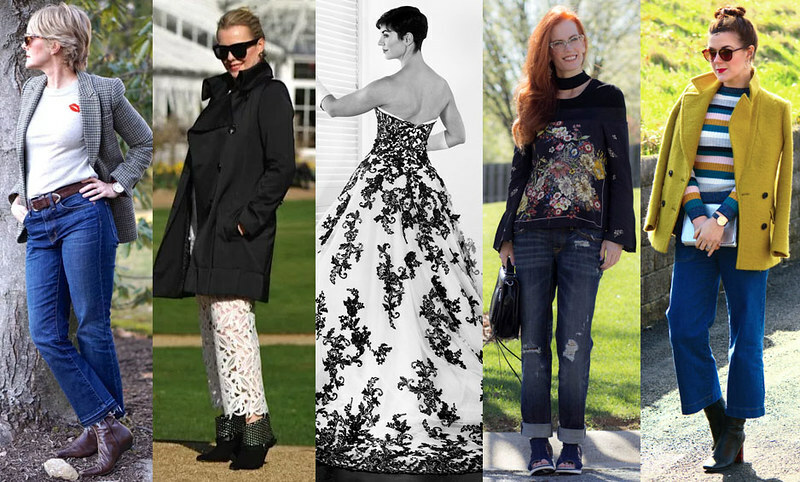 The monochrome look was purely accidental, but if you look at the full-length photos you will see that the outfit looks pretty much the same colour from head to toe (squint a bit if you’re not quite getting it) – a plummy-burgundy red colour. 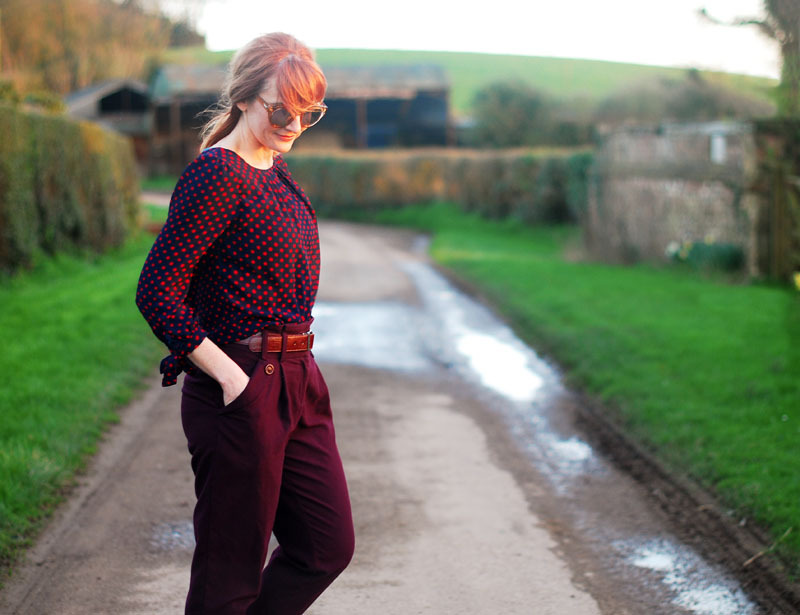 What I didn’t realise was that the navy blouse with red polka dots (similar) looks like burgundy at a distance, and in fact the same burgundy of my go-to favourite peg trousers. 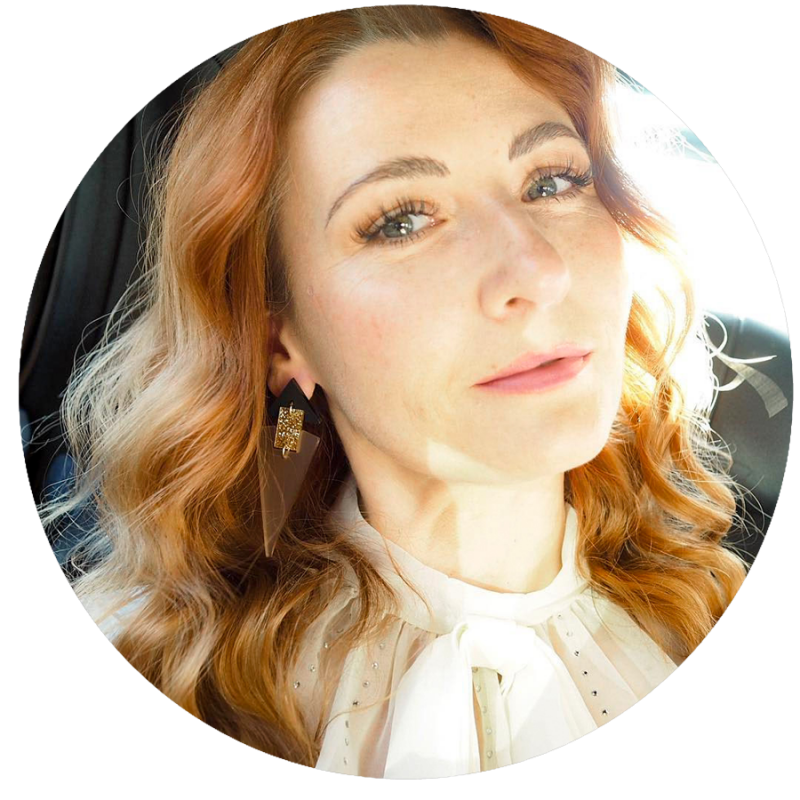 I love the three colours (that you can see in the close-up photo below of the blouse and trousers) together – add silver in the form of my fabulously-comfortable Finery two-tone slip ons and you have yourself one very easy-to-wear outfit. It was perfect for travelling the 2.5 hour journey to our friends’ house, perfect for lounging around and watching the rugby, and perfect for a spot of Dad dancing later on. 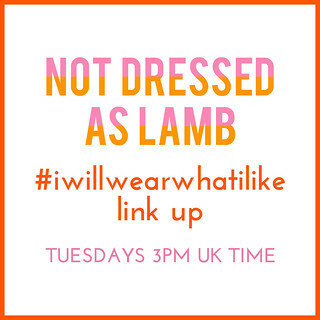 This Wednesday I’ll be featuring more shoes (well, boots) from Finery, in fact a whole outfit from the British brand. 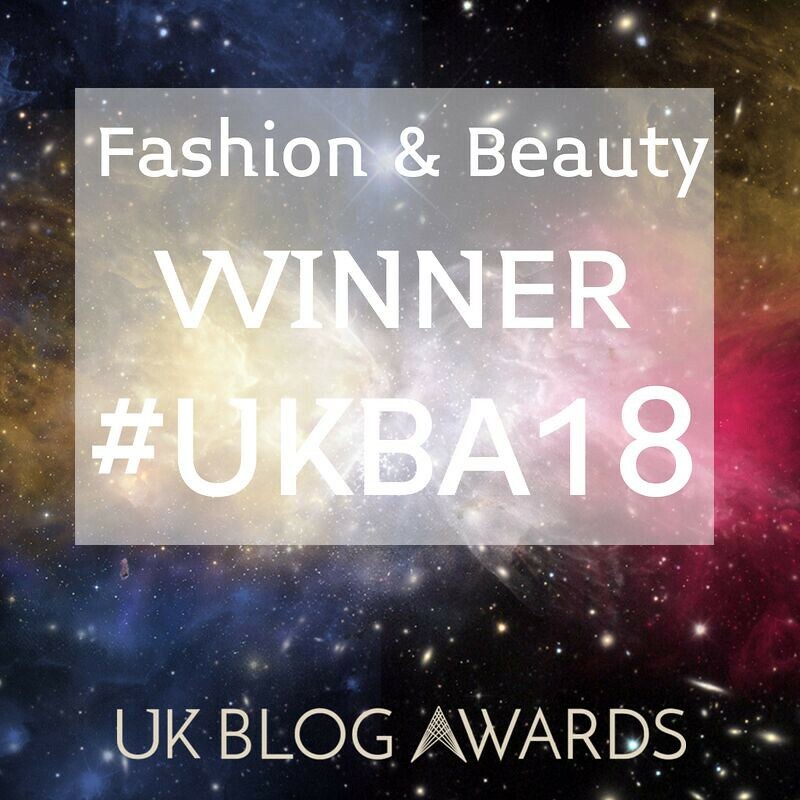 If you haven’t checked them out yet please do – they’re a young online-only brand with some very edgy but very wearable items, and the quality is second-to-none considering the reasonable prices. 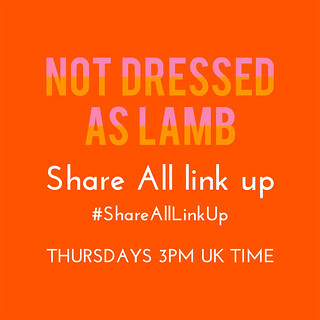 So all that’s left to say is do add your outfits to this week’s link up and if you’ve added a link to here or my button to your post you may be featured next week! This is what I call a bloody great outfit. It looks simple but it isn't. What a fantastic find. And those shoes are such a good choice to wear with it. Wouldn't mind these shoes myself. Well, in fact the whole outfit, but that is greedy. This look is right up my street Catherine! Dotty loveliness and peg-leg breeks (not that they really suit my shape, but I wear them anyway!). what a gorgeous monochromatic look! My favourite piece is the trousers.. wowzers they are beautiful! super cute outfit! I love your top!! This look loooks so good on you! I love those shoes too! You are perfection in polka dots! Love this spring look! Yes, I'm keen on polka dots too Catherine. 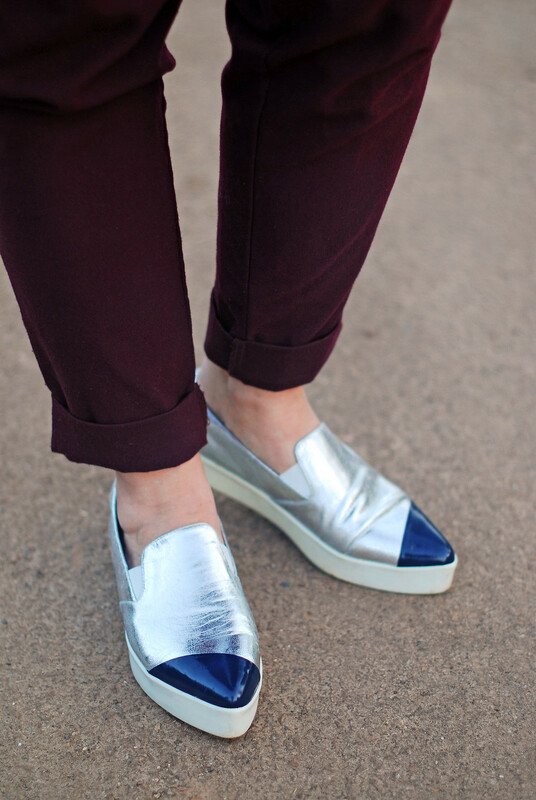 I love your clever monchrome trick here, but most of all I totally adore those silver shoes. Looks like you pitched it perfectly for your outing – chic, stylish and comfortable too! I never thought about making a monochrome look with polka dots! I absolutely love that top and you sneakers. Oh it is such a pretty blouse and the entire monochromatic look is perfection. I, of course, love all polka dots. And those shoes have left me in a swoon! I wore monochrome with polka Dots too last week! But I wore it in black, in color its very beautiful! Great look! Great polka dots! I like them too, but so far the only dots I have are on tights, and fairly small ones at that. Monochrome with a twist, just as I like it. Beautiful colour, beautiful light! And of course "our" silver shoes… Aren't they fabulous? 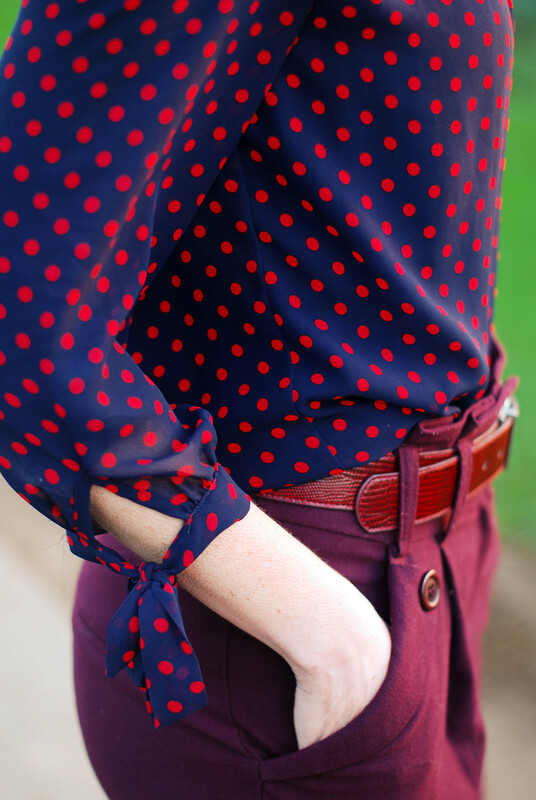 That's really fun that the polka dot blouse looks burgundy from a distance! I really like this outfit! The shoes are so cool, too! Amazing Look! Love that polka dotted shirt and those shoes!